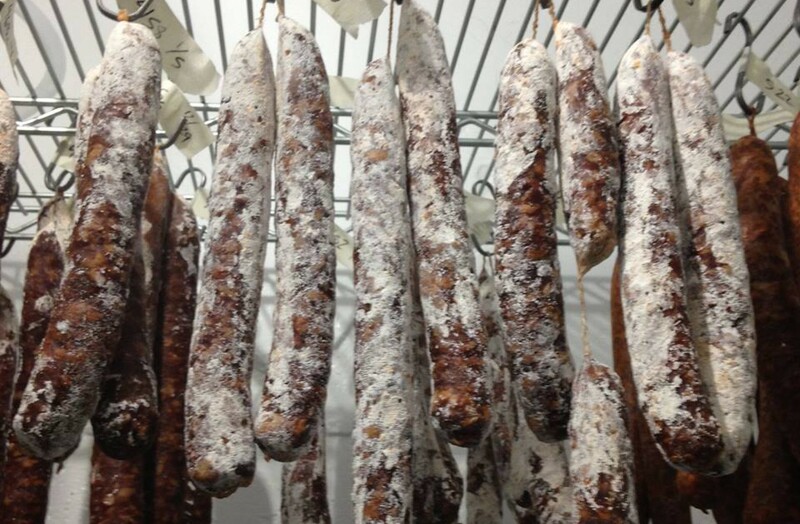 On May 16, 2011 By punkrockfoodforumIn Charcuterie 2011, Cheese Making, What's for Dinner? Merguez or chorizo, merguez or chorizo…hmmm. How ’bout both? This month, for the May Charcutepalooza challenge, we grind. The wonderful, balanced combination of meat and fat. Merguez, a North African inspired yet French influenced lamb sausage rich with red wine and roasted red peppers. Chorizo, of the Mexican variety and not Spanish, smoky and flavorful with Ancho chiles. With two wonderful things to choose from, we ended up making both. The Merguez was frozen (not before we sampled a bit- wonderful!) and will be cased later. With the chorizo, we made simple tacos topped with an avocado-tomatillo salsa and home made 7 month old cheddar. A squeeze of lime, the pop of cilantro, these tacos were proof that great food doesn’t have to be complicated. A simple meal of hand made ingredients shared with friends is a great thing.